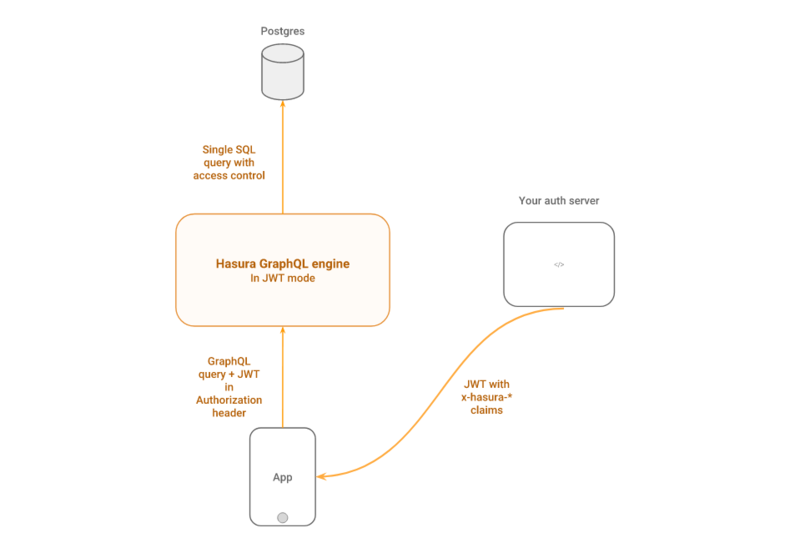 You can configure JWT authorization mode (see GraphQL server options) to authorize all incoming requests to Hasura GraphQL engine server. The idea is - Your auth server will return JWT tokens, which is decoded and verified by GraphQL engine to authorize and get metadata about the request (x-hasura-* values). The JWT is decoded, the signature is verified, then it is asserted that the current role of the user (if specified in the request) is in the list of allowed roles. If current role is not specified in the request, then the default role is picked. If the authorization passes, then all of the x-hasura-* values in the claim is used for the permissions system. Configuring JWT requires Hasura to run with an admin secret (--admin-secret). JWT authorization is enforced when X-Hasura-Admin-Secret header is not found in the request. JWT authorization is skipped when X-Hasura-Admin-Secret header is found in the request. The JWT must contain: x-hasura-default-role, x-hasura-allowed-roles in a custom namespace in the claims. Other optional x-hasura-* fields (required as per your defined permissions). You can send x-hasura-role as header in the request to indicate a different role. Send the JWT via Authorization: Bearer <JWT> header. The claims in the JWT, can have other x-hasura-* fields where their values can only be strings. You can use these x-hasura-* fields in your permissions. Now, the JWT should be sent by the client to Hasura GraphQL engine via the Authorization: Bearer <JWT> header. This contains standard (sub, iat etc.) and custom (name, admin etc.) JWT claims, as well as Hasura specific claims inside a custom namespace (or key) i.e. https://hasura.io/jwt/claims. The https://hasura.io/jwt/claims is the custom namespace where all Hasura specific claims have to be present. This value can be configured in the JWT config while starting the server. Note: x-hasura-default-role and x-hasura-allowed-roles are mandatory, while rest of them are optional. All x-hasura-* values should be String, they will be converted to the right type automatically. The default role can be overridden by x-hasura-role header, while making a request. key or jwk_url, one of them has to be present. Valid values are : HS256, HS384, HS512, RS256, RS384, RS512. (see https://jwt.io). HS* is for HMAC-SHA based algorithms. RS* is for RSA based signing. For example, if your auth server is using HMAC-SHA256 for signing the JWTs, then use HS256. If it is using RSA with 512-bit keys, then use RS512. EC public keys are not yet supported. In case of symmetric key (i.e. HMAC based key), the key as it is. (e.g. - “abcdef…”). The key must be long enough for the algorithm chosen, (e.g. for HS256 it must be at least 32 characters long). In case of asymmetric keys (RSA etc. ), only the public key, in a PEM encoded string or as a X509 certificate. This is an optional field. You can also provide a URL to fetch JWKs from using the jwk_url field. This is an optional field. You can also provide the key (certificate, PEM encoded public key) as string as well - under the key field. Some providers rotate their JWKs (E.g - Firebase). If the provider sends an Expires header with the response of JWK, then graphql-engine will refresh the JWKs automatically. If the provider does not send Expires header, the JWKs are not refreshed. 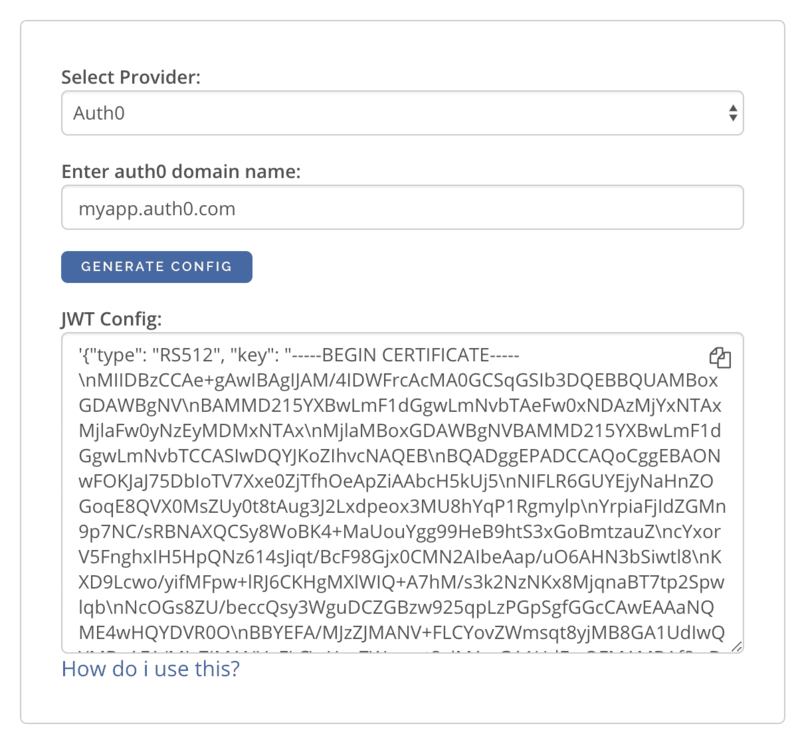 Auth0 publishes their JWK url at: https://<YOUR_AUTH0_DOMAIN>.auth0.com. But Auth0 has a bug. See known issues: Auth0. Firebase publishes their JWK url at: https://www.googleapis.com/service_accounts/v1/jwk/securetoken@system.gserviceaccount.com. This is an optional field. You can specify the key name inside which the Hasura specific claims will be present. E.g. - https://mydomain.com/claims. This is required because providers like AWS Cognito only allows strings in the JWT claims. See #1176. The key is the actual shared secret, which is used by Hasura and the external auth server. If your auth server is using RSA to sign JWTs, and is using a 512-bit key. In this case, the JWT config needs to have the only the public key. "key": "-----BEGIN PUBLIC KEY-----\nMIGfMA0GCSqGSIb3DQEBAQUAA4GNADCBiQKBgQDdlatRjRjogo3WojgGHFHYLugd\nUWAY9iR3fy4arWNA1KoS8kVw33cJibXr8bvwUAUparCwlvdbH6dvEOfou0/gCFQs\nHUfQrSDv+MuSUMAe8jzKE4qW+jK+xQU9a03GUnKHkkle+Q0pX/g6jXZ7r1/xAK5D\no2kQ+X5xK9cipRgEKwIDAQAB\n-----END PUBLIC KEY-----\n"
But they have a bug where the certificate thumbprint does not match. Hence, currently this URL does not work with Hasura. The JWT Config to be used in env HASURA_GRAPHQL_JWT_SECRET or --jwt-secret flag can be generated using: https://hasura.io/jwt-config. Currently the UI supports generating config for Auth0 and Firebase. The config generated from this page can be directly pasted in yaml files and command line arguments as it takes care of escaping new lines.